Moringa oleifera is also known as horseradish tree or drumstick tree. Originally coming from tropical and subtropical countries, this Indian herb is best known for its numerous health benefits. It is believed that the Moringa tree originated in northern India and was being used in Indian medicine around 5,000 years ago. There are also accounts of it being utilized by the ancient Greeks, Romans and Egyptians. This tree was, and still is, considered a panacea, and is referred to as the ‘The Wonder Tree,’ ‘The Divine Tree,’ and ‘The Miracle Tree,’ amongst many other names. The roots, stems, leaves, seed pods, resin and flowers are considered to be healing herbs in Ayurvedic – a traditional Indian healing system – and Unani – traditional Middle Eastern healing system – folk medicine. In modern times, the leaves and seed pods are utilized extensively due to their nutrient content and studies are investigating their healing potential. 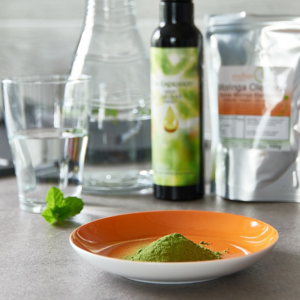 Moringa has a wide range of antibiotics, antioxidants and nutrients, including vitamins and minerals. It has over 92 nutrients and 46 antioxidants and all the essential amino acids which is quite rare for plant foods. It is also said that Moringa help controls blood pressure, relieves headaches and restores skin condition. It can curb your appetite and provide lasting energy as well. Moringa is available in many forms like dried leaves and capsules, though due to its possible effects on hormones and cholesterol, it is important to check with a doctor or specialist before using. Ara N, Rashid M, Amran MS (2008). Comparison of Moringa oleifera Leaves Extract with Atenolol on Serum triglyceride, Serum Cholesterol, Blood glucose, heart weight, body weight in Adrenaline Induced Rats. Saudi J. Biol. Sci. 15:253-258. Pari L, Kumar NA (2002). Hepatoprotective activity of Moringa oleifera on antitubercular drug-induced liver damage in rats. J. Med. Food 5:171-177. Singh BN, Singh BR, Singh RL, Prakash D, Dhakarey R, Upadhyay G, Singh HB (2009). Oxidative DNA damage protective activity, antioxidant and anti-quorum sensing potentials of Moringa oleifera. Food Chem. Toxicol. 47:1109-1116.